A dwarf, much-branched, creeping shrub which forms dense patches or low hummocks of deep- or bluish-green foliage. The patches are usually 2-4 cm thick and vary from 30-40 cm or more across. Leaves: Small and hard, 3-5 mm by 1-2 mm, deep green above and slightly paler beneath. Flowers: Small, whitish, honey-scented, borne singly near the tips of the branchlets; similar to those of Cyathodes colensoi. 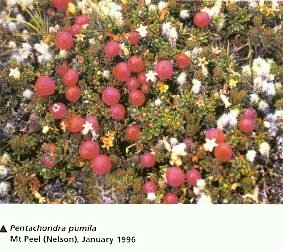 Fruits: Bright red, berry-like, 5-6 mm in diameter, hollow inside and with five or more small nutlets. 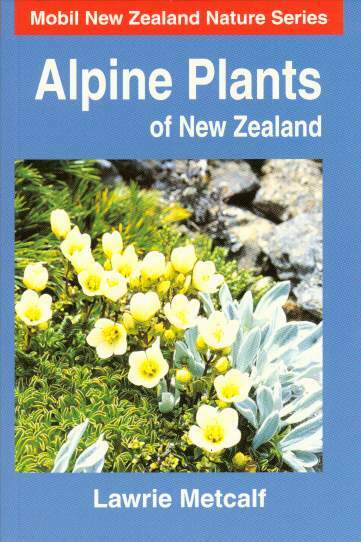 North, South and Stewart Islands in subalpine to low-alpine areas from the Coromandel Peninsula southwards. Very common in the South and Stewart Islands, but rare north of East Cape in the North Island. 600-1500 metres. Occurs in cushion bogs, open snow tussock grasslands, herb-fields and herb moor. Frequently grows in exposed or rocky sites or in poorly drained peaty areas. Fruits: The fruits take two seasons to ripen, being quite small and green by autumn and maturing during the following summer. Identification: The hollow fruits distinguish this species from other plants of a similar appearance.